The cloud-free composite over Northern Morocco, at 10m spatial resolution, has been produced using data acquired from Sentinel 2A, and has been processed to demonstrate and promote the spatial coverage and resolution. The selected dataset, covering Northern Morocco, is part of Sentinel 2A overpasses from the 1st to 30th of June 2016 and from 1st to 31st of July 2016¹. 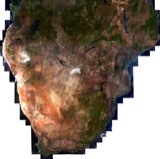 The Sentinel 2A composites have been generated applying the darkest pixel selection method over the Northern Morocco, it covers an area of about 1000 km x 550 km and has been constructed from 170 Sentinel-2A L1C tiles (100km x 100km, at 10m spatial resolution). The images above represent the zoom on Sentinel 2 cloud-free composite over Moroccan cities of Marrakesh and Casablanca. Cloud-free composites over Northern Morocco using Sentinel-2 data acquired in June and July 2016. The cloud-free composites over Northern Morocco mentioned above resampled at 40m and converted in TIFF. 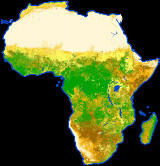 Images in TIFF format focused over Marrakesh, Casablanca, Rabat, Tangier and Fes at full resolution (10m). To open the two Sentinel-2 cloud-free composites at 10m spatial resolution over Northern Morocco (North-Morocco_June2016_RGB-10m_NetCDF.nc and North-Morocco_July2016_RGB-10m_NetCDF.nc) the user should use remote sensing software (e.g. SNAP, Q-GIS, ENVI, …) importing the files and choose the right RGB band combination: R=Red, G=Green, B=Blue. These files have been created for scientific purposes, in fact, the data are Top Of Atmosphere Reflectance (scaling factor equal to 10000) and include the geo-location information (Lat/Lon - WGS-84). To visualise the TIFF images containing the cloud-free composite over Northern Morocco in June and July 2016 at 40m spatial resolution and the zoom over the major Moroccan cities at 10m spatial resolution the user can use a generic image viewer. These images do not contain the geo-location information and therefore are not applicable for scientific purposes. The cloud-free composite over Northern Morocco in June 2016 at full resolution (10m) can be visualised at http://esamultimedia.esa.int/micrio/morocco.html. This HR viewer has been developed by Q42 Company under a project of the Communication Office of the European Space Agency. N.B. The obtained data are Top Of Atmosphere Reflectance with a scaling factor equal to 10000.